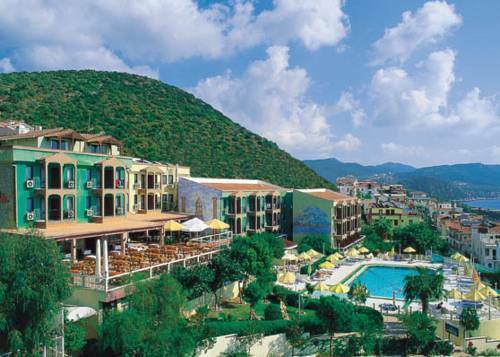 Hotel Club Phellos Kas, Hotel Turkey. Limited Time Offer! Hotel Club Phellos. "Hotel Club Phellos" has obtained 3 stars. 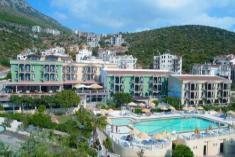 It is excellent for visiting Kas. After a long or busy day, a visit to the sauna will help you feel refreshed. Take a bath in the hamam. The hotel has its own restaurant. For a drink in company, feel free to visit the bar. Guests can connect to the Internet at no extra charge. Talay Pansiyon offers air-conditioned rooms only 50 metres from Kucukcakil Beach and 750 metres from Buyukcakil Beach. The pension has a rooftop terrace with extensive views of the Mediterranean Sea. This cosy hotel is just a 5-minute walk away from the centre of Kas and across from the beach, providing cheerful accommodation with free sun beds at the beach.